For those of you that remember the years leading up to the launch of the Secret World and the ARG that we all played during that time, it looks like the ARG is coming back and it'll be an ongoing thing for the game. For those that never played the Secret World ARGs, the acronym stands for alternate reality game and is about providing a story and missions in real life as opposed to within the confines of the game. So you'll probably be given real clues and puzzles to further a fictional story. The ARG is created by Human Equation, who brought the Secret World community The End of Days ARG in December 2012 and the first Black Watchmen ARG right before the launch of the Secret World. The new ARG will be persistent and will be coming in September 2014. I actually only participated in the original ARG and never played the MMO game, so I find that I'm intrigued by the idea of an ARG being a persistent game. funcom outsourced their ARGs for tsw previously to i believe this company. yes, they did. 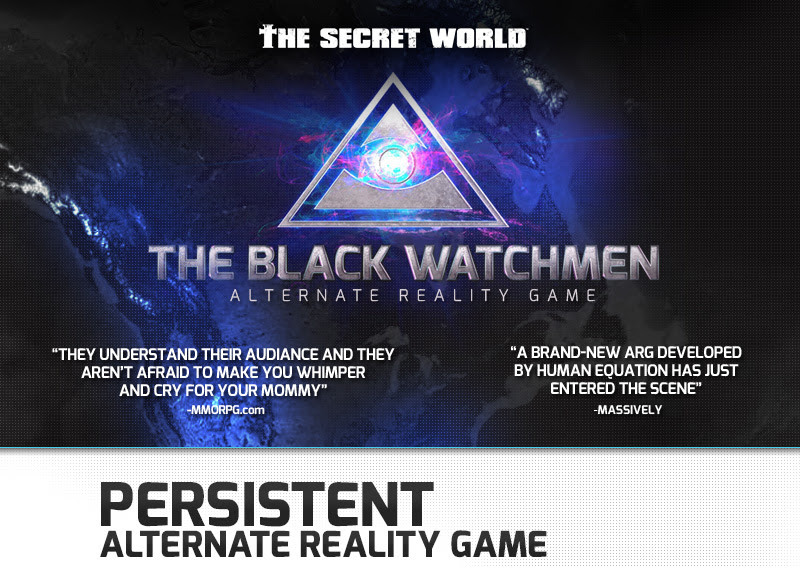 This arg apparently is splitting itself off from TSW though and becoming its own game. BTW - here's an interview about it. never got into this for TSW's pre launch. it was a little weird and really brought out the crazies. i had some involvement with the discordian movement years ago and they basically do this kind of thing but actually believe it's real. and those guys were out in spades for the TSW prelaunch campaign early on. had one guy ask to join my guild becuase in my sig i had quotes from teh illuminatus! trilogy by robert shaea and robert anton wilson. he didn't care about anything about the guild or anything, only played with us a couple times really, but he saw my sig and had to be in my guild. TSW itself makes a lot of jokes about these kinds of people at least early on in kingsmouth without using any of their direct references they are always looking for and very present especially in hollywood movies and tv shows. for examples there's tonnes of discordian symbolism in the matrix movies, the jim carey movie the number 23 is basically a dramatisiation of the discordian axiom of the law of fives. mostly it's this weird lunatic fringe blip into american pop culture that dates back to the 60s when some crazy hippies wrote a joke religious tract and xeroxed it and spread it around. the main guy behind it, kerry thornley began to really believe it, as well as that he was involved directly in the plot to assassinate JFK (and he sort of was, and his little group was portrayed as the secret gay group in the movie JFK). alot of it's been overtaken in lunatic fringe culture by stuff like david icke's reptillian illuminati and ancient aliens and sucyh, but if you look further back to the early days of the mass internet and world wide web, there's some notable commerical exploitation of the whole thing, mostly by steve jackson who based some games on the whole thing and made his own copyrighted principia discordia(that'd be the name of the joke religious tract thornley and his friend greg hill made in the 60s). there's still a cult following for this online, with various groups of people who have different aims and goals with it. and most of them take it very seriously. and took TSW very seriously as well. I find the crazies fun. You do have to take it with a grain of salt though. I'd hate to think of what happens when super paranoid people get deeply involved. Thankfully, I don't work for that company and it's unlikely that they will affect me. I did hear about a guy I know that apparently started a religious cult in the online game he plays just to see how far it would spread and apparently some of what he's come up with has become lore or something. Which is just outright funny. meh being a crazy person myself i don't much like other crazy people. Do you make them get off your lawn? no i just back away slowly while giving them the side eye. and try to pass on the other side of the road. Well you gotta give credit to Funcom and Human equation for breaking new ground with Arg's (alternatve reality games) in the world of mmorpg's. Not sure how many will want to give their personal details for the deepest arg experience but there are those who like to live & sleep in their fantasy games. Good luck to ARG, at the very least it should generate more interest in TSW and bring in more players which in itself is something that older mmo publishers can only dream about with their often dwindling populations..